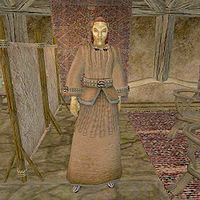 Tyermaillin is an Altmer healer who has a house in Balmora. He is a member of the Blades, one of the trainers that Caius Cosades will recommend to you, and if you are also a member, he will sell you ingredients, potions, and spells, as well as provide medium training in Enchant, Mysticism, and Restoration, and also has a free bed to sleep in if you need it. If you ask him about "Blades Trainers", he will give you a free journeyman's alembic. He is otherwise not related to any quests, and only provides a little unique information regarding the Blades business. He lives below Rithleen, a fellow Blade member. [Journeyman's Alembic has been added to your inventory.] Blades Trainers: "Basic skill training is cheap. We give you discounts for higher rank in the Blades, and we keep our prices low. But advanced training is never cheap, even from us. Look. To get you started, here's my old alembic. Maybe you can get a few gold for it, or use it yourself." latest rumors: "I'm just support here. I don't pay much attention to what's going on." While Tyermaillin is listed as selling Magic Items, there are no Magic Items of the types that he sells, so this distinction is fairly meaningless. A bug with the map does not show his house as it is under Rithleen's House. * Tyermaillin sells three pairs of spells identical in all but name, making the second versions almost completely redundant.